Alfa Laval, of Richmond, Va., recently published a brochure presenting the company’s line of spiral heat exchangers. 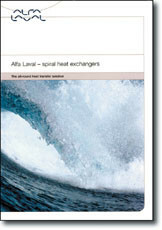 “Alfa Laval Spiral Heat Exchangers – the All-Round Heat Transfer Solution?? is a 16-page, four-color brochure describing the company’s five variants of spiral heat exchangers. The exchangers can be used for a wide range of applications from dirty fluids to high vacuum condensation. They offer the unique advantage of exceptional compactness and a self-cleaning design.